This is the fourth explainer in a six-part collaboration between Ben Bovarnick (FES ’18) and Sara Harari (FES ’19, SOM ’19). The collection closely examines the barriers facing adoption of new, advanced energy technologies that can revolutionize electric-grid operations and utility business models and spark potential solutions to elicit faster transformation in this expansive industry. Typically, when we talk about the challenges facing deployment of advanced energy technologies, we focus on decisions at the state level about energy adoption. We talk about the pros and cons of how state commissions and elected officials can steer energy policy to support new technologies. That’s because a lot of the cool new energy technologies on the market today have the potential to enhance performance of the electric grid at the local distribution level. On top of that, new technologies that impact the distribution grid are ones that we see in our homes, like smart thermostats, and in our neighborhoods, like solar panels. However, that’s only part of the story. New transmission technologies are being developed for the entire system, not just local distribution networks. These new technologies, such as advanced power-flow control, dynamic line rating, and advanced topology-flow control, allow for more effective investment in infrastructure. Many of the barriers to integrating advanced energy technologies in distribution systems are also present in high-voltage transmission infrastructure. As we discussed on in our first post, "Electricity Evolution: Meet the Ringmasters," the federal government both regulates interstate transmission networks and funds research for energy innovation. In the United States, electricity is transmitted on two separate systems: transmission and distribution. Even though you may not hear about it as often, United States transmission grids are ripe for integration of new energy technologies. 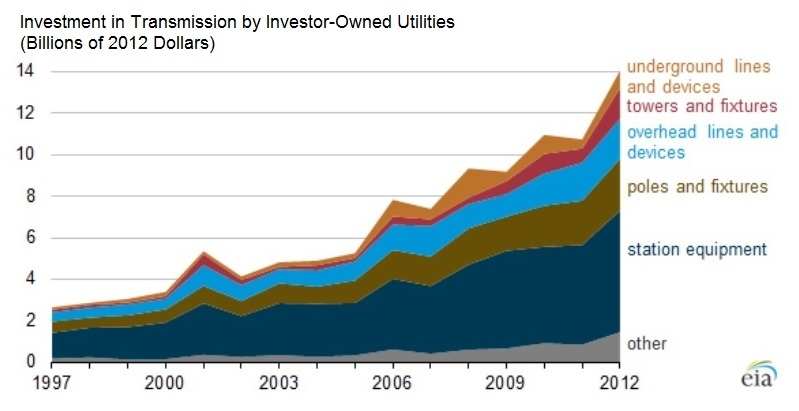 In the last 20 years, many investor-owned utilities invested heavily in upgrading their transmission infrastructure. They did this primarily to address reliability concerns, replace aging infrastructure, and reduce grid congestion. Following the Northeast Blackout of 2003 and the blackout caused by Hurricane Sandy in 2012, utility companies sought investment in resilience and reliability. Additionally, new transmission construction can bring remote renewable energy power to the grid, allowing more variable energy onto the grid. In the same way that you pay your electric utility for every kWh of power you use, transmission operators charge fees for access to electric generators or distribution utilities. These fees are based on the amount of power flowing through the transmission lines. When upgrades or new investments for transmission infrastructure are needed, transmission owners can elect to make new investments and recover the costs by increasing these rates. Just as public utility commissions grant approval for distribution investments and rate increases, the Federal Energy Regulatory Commission (FERC) approves interstate transmission infrastructure upgrades. FERC also evaluates whether proposed transmission rates are just and reasonable. FERC jurisdiction encompasses United States wholesale markets with the exception of the Energy Reliability Council of Texas. To make a national impact on transmission rates or how transmission providers make new investments, you have to get involved at FERC. With billions of dollars slated for investment in transmission over the next five years, developers and vendors of new technologies for the transmission system might have a golden opportunity to deploy their products. However, persistent barriers remain. And without a proven track record, new technologies face an uphill battle. While the transmission operators we spoke with acknowledge the benefits that new technologies can bring to the grid, they emphasized that their mandate is to provide highly reliable service. This makes it difficult to test out new technology in real time. This is particularly challenging when utilities and other transmission operators bear the financial cost of piloting new technology. The role of the federal government in bringing advanced energy technologies to transmission grids is not limited to regulation. Due to the complex planning and investment structure within the transmission sector, it can be perilously hard for new technologies to find a foothold in the grid. Many innovative, nascent technologies receive funding from the United States Department of Energy or through congressional appropriations like the American Recovery and Reinvestment Act. One such critical sources of early funding is the Advanced Research Projects Agency – Energy (ARPA-E), a government agency that funds and supports early-stage energy technology research with the specific objective of developing market-ready projects. ARPA-E provides innovators with support to surmount the hurdles inherent in bringing new electric transmission technologies to market. Erik Desrosiers, who previously worked as a technology-to-market advisor at ARPA-E, said there are substantial challenges in persuading transmission owners to consider new technologies. As we discussed in our last post, the conventional utility business model revolves around installing capital-intensive upgrades. “New technologies are interesting because ratepayers win with improvements in efficiency,” although they face an uphill battle against the conventional business model, Desrosiers said. ARPA-E initiatives to support transmission optimization fund both hardware solutions and software technology. The hardware solutions include Smart Wires. The executive said that without ARPA-E’s backing, reaching RTOs would have been much more challenging. Despite the support ARPA-E can offer in introducing technology vendors to prospective clients, it often isn’t enough. Vendors self-organize into advocacy groups as well. When your prospective customers are massive, interstate transmission operators, sometimes the most effective way to develop your market is to secure guidance from FERC. Rob Gramlich, executive director of the newly minted group Working for Advance Transmission Technologies (WATT), said his group includes both software and hardware vendors among its members. WATT is currently advocating FERC change the incentive structure for transmission entities. WATT encourages regulators to consider changing the incentive structure to open the doors to new, cost-efficient transmission technology upgrades. It’s WATT’s role to advocate for its member vendors to FERC to level the playing field for new technologies. WATT does this by encouraging FERC to host convening meetings around valuation issues and new technology best practices. FERC can also provide targeted assistance within specific regional markets during RTO and ISO rate cases. In the future, WATT may also seek comprehensive reform at the national level by revising the metrics used to evaluate upgrades to the nations transmission infrastructure. Ultimately, FERC has the authority to provide the system-wide reforms that could alter the calculus of whether transmission owners decide to pilot new technologies or invest in efficiency services. FERC issues reforms through orders that are implemented by the RTOs. They impact utility transmission providers who must comply with these rules. In 2006, FERC issued Order 679, which increased the Return on Equity transmission companies could enjoy when investing in high-risk transmission projects. However, Order 679 has not produced significant incentives for transmission owners to invest in emerging technologies or new pilot projects. More recently, FERC used this process to implement a new rule, Order 1000, that initiated reforms to the transmission planning process and cost allocation for new investments. These federal reforms are designed to foster market evolutions and have already begun to open the door for wider integration of new technologies. For example, FERC Order 745 is designed improve the compensation for demand response and energy storage projects to reduce electricity consumption when called upon. This incentive can increase the overall efficiency of the grid. Actions like these demonstrate the powerful ways that FERC can enhance the market opportunities for new energy technologies. They also show the clear role that national regulation plays in electricity markets. However, despite the work of WATT and other trade organizations, it’s still uncertain what broad market reforms from FERC we can expect to see for transmission technology in the next few years. This means that new technology developers cannot depend on regulatory action to secure or even open up new markets. For now, they must continue to seek receptive transmission owners or connect with ISOs or RTOs that are interested in piloting their technologies. They must seek out other opportunities to achieve the coveted “proven technology” status.